In Zaragoza, on 12 November, more than 100 Spanish, French and Andorran experts attended the conference on natural risks and climate change in the Pyrenees organised within the framework of the OPCC2 project of the Pyrenees Working Community, CTP. During the conference, the great challenges associated with climate change and natural risks in the mountain range were addressed. The conference featured two thematic seminars and a round table. The seminar on climate change, organised in collaboration with the POCTEFA projects REPLIM, CANOPEE, PIRAGUA, CLIMPY and FLORAPYR, included the presentation of the OPCC2 report “Climate change in the Pyrenees: impacts, vulnerabilities and adaptation. Knowledge bases for the future strategy of adaptation to climate change in the Pyrenees”. The different scientific coordinators of the report presented the key ideas from the 13 chapters. The most significant observed and expected sectoral impacts were highlighted, as well as some recommendations for adaptation. In the seminar on natural risks and civil protection, organised in collaboration with other POCTEFA projects (ALERT, SECURUS, HELINET, INTURPYR and COOPEREM), the main challenges to preventing natural risks in the Pyrenees were presented. During the different presentations of this session, the fundamental role of civil protection in disaster management was emphasised, as was the importance of early warning systems in their prevention. Attendees of both seminars then came together for a round table that brought the sessions to a close. 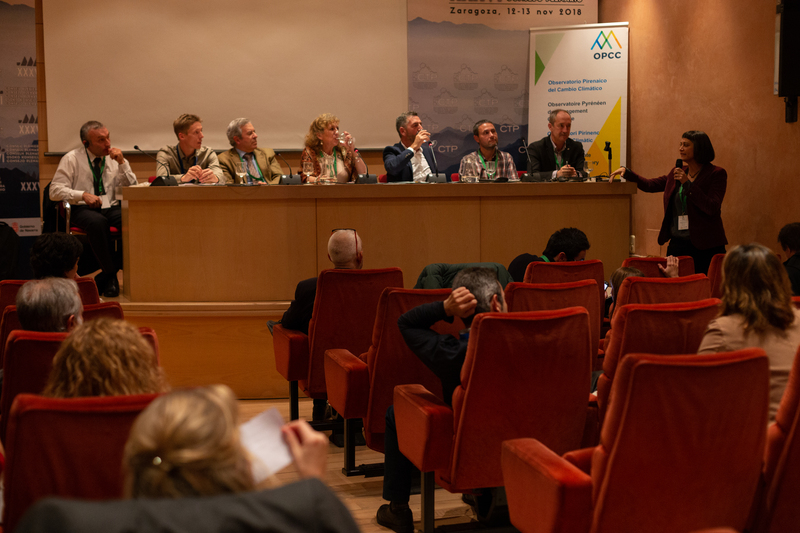 The six experts who participated in the debate analysed the possible implications of climate change in the prevention and management of natural risks on both sides of the Pyrenees mountain range. Miguel Ángel Clavero Forcén (Head of the Security and Civil Protection Service, Directorate-General of Justice and the Interior) reiterated the importance of the early launching of the relevant warnings and alerts that might result in Civil Protection action. He also stated that “climate change is causing a decline of certain forest species, which in synergy with the abandonment of traditional uses of the Pyrenean territory could have potential consequences in the form of forest fires”. However, “we have to learn to live with risk. This means that it is necessary to include the effects of climate change in the cartography of hydrological and geological risks, although this is a challenge given the uncertainties”, according to Xavier Planas Batlle (Àrea d’Urbanisme, Ministerid’Ordenament Territorial, Government of Andorra). In any event, “whatever the impact of climate change on rainfall, it will affect the frequency and intensity of many hydrological and geological events that carry risks. Therefore, the important thing is to anticipate and prepare to deal with the changes. This preparation involves increasing the knowledge and history of hydrogeological events in the Pyrenees”. To conclude, Joseph Bonson, (Service Départemental d’Incendie et de secours des Pyrenees-Atlantiques) maintained that “the challenge today imposed by climate change is the anticipation of episodes that carry risks, which are much more spontaneous than in the past, and to be able to react more quickly”. To the challenges imposed by nature due to the effects of climate change, we should also add the difficulty of alerting the population early in a cross-border mountainous territory. In this regard, cross-border cooperation offers an effective framework for the anticipation, prevention and reduction of natural risks in the context of a climate that is changing.